Hello, I’m here again with that 12 Days of Anime thingy! I didn’t know what to do, but Kyo said something about writing whatever I want about something I loved in 2012. Seeing the others’ posts (lvlln’s sensual toothbrush, Fosh’s memetic Guilty Crown, Kyo’s TYPE-MOON that will always pop out every year, and Kara’s chronic Seiyuu Disease), I figure I’m going to write about my favorite antagonist of this year, the Phantom Troupe. Why Phantom Troupe, when there are other villains that are logically better than Phantom Troupe? Guilty Crown‘s Gai is somewhat unique (not really), and the BETAs in Muv Luv are definitely the most terrifying villains of this year (trust me, I’ve finished Muv Luv visual novel. I KNOW). It’s simple: Phantom Troupe is awesome. If you don’t think they’re not awesome, we need to have some serious talk. Some history about them first. 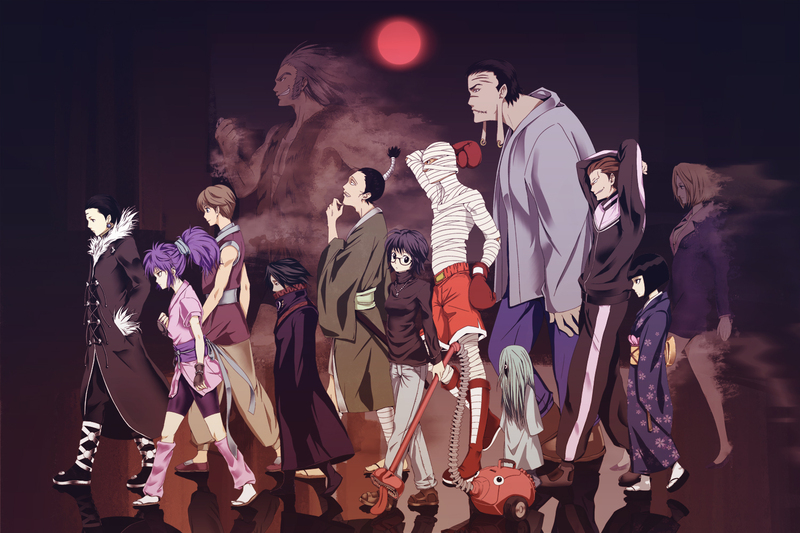 Phantom Troupe was created in the Meteor City, junkyard city in Hunter x Hunter where outcasts live. In fact, the seven founding members of the Phantom Troupe (Chrollo, Feitan, Franklin, Machi, Nobunaga, Pakunoda, and Uvogin) themselves are residents of Meteor City (the reason they move out of the city is unknown). Phantom Troupe consists of thirteen members and will always be thirteen, including the leader himself. All members, without exception, are treated as equal and should follow the rules of the Phantom Troupe. If there is disagreement between the members, it should be solved with Coin Tossing because serious fights are prohibited among the members. The most important of all, every member should devote their life for the good of the Spider (symbol of the Phantom Troupe). Even at first glance, the individuality that exists in the Phantom Troupe can be seen already. Made out of thirteen members including the two dead members and one who “resigned,” (he’s replaced already) each member of Phantom Troupe have different style of clothing. Not only that, their behaviors and personalities are varied. This can be seen from the different kinds of power and Nen each member has. Even in their daily lives (and sometimes in missions too), it’s not uncommon for them to argue with each other. And yet, the Phantom Troupe stayed strong through time. The leader Chrollo is away doing his own mission, but there’s no sign that Phantom Troupe is going to disband any time soon. The reason is as simple as the reason why they’re so awesome: the bond among members is that strong. Even when the leader is away, the other members try to help him. The dead Pakunoda was willing to sacrifice her life just for the sake of the leader, in pretense that “The Spider still needs him [Chrollo]”, when it’s obvious that she was breaking the rule of the Spider. Nobunaga tried to recruit Gon, but that because he sees Uvogin in him. How about the ones that are dead? Their position are not replaced yet, unlike Hisoka‘s position. This shows how Chrollo and the others still treat Pakunoda and Uvogin as members even though they are dead. Phantom Troupe is not just a mere group but a family in its own. This is why I love Phantom Troupe. Their super powers are cliche (duh, Shounen Jump), compared to Gai’s Guilty Crown, and I’m pretty sure as hell Phantom Troupe won’t be able to defeat the BETA in Muv Luv. However, I appreciate the sense of unity each member has when it comes to the Spider. They dedicate every second of their lives just for their family. Being a fangirl who’s a sucker when it comes to dedication and nonsense like that, I instantly fell for them. In the world of Hunter x Hunter, where having super power is like a daily thing, dedicating one’s self to a cause sounds easy. Unfortunately, great powers come with twisted personality. With great powers, it’s not hard for someone to become selfish and irresponsible. Just look at Hisoka. 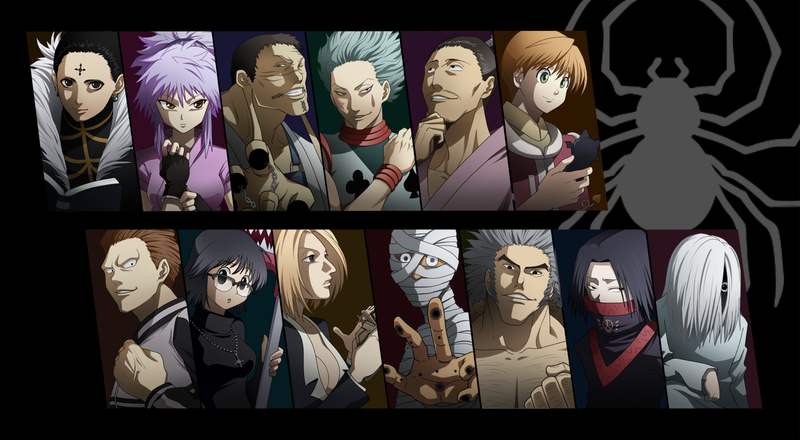 So yeah, kudos for the members of the Phantom Troupe for staying the way they are until now and faithful to the Spider. I admire them for that and if you are watching HxH, you’ll get what I’m saying. So, do you have a certain liking to a 2D group, who inspired you recently? It doesn’t necessarily have to be from 2012. The Phantom Troupe is excellent. I liked Hunter x Hunter (both original anime and remake) plenty before they showed up, but their presence definitely kicks the story up a couple of notches because they’re all such distinct, strong characters. Love their style, love the way they carry themselves, and I love their interactions with each other. I’m glad they’ll continue to pop up in the story every so often. I wouldn’t say they’re regulars, but they are a bit more than cameos — in Greed Island, at least. Not familiar with the series beyond that, though I did hear they make appearances in subsequent arcs, too. In anime, we admire villains just as much as heroes but sometimes the former is a lot interesting than the latter. Certain of them are so awesome that you’d want them to win. 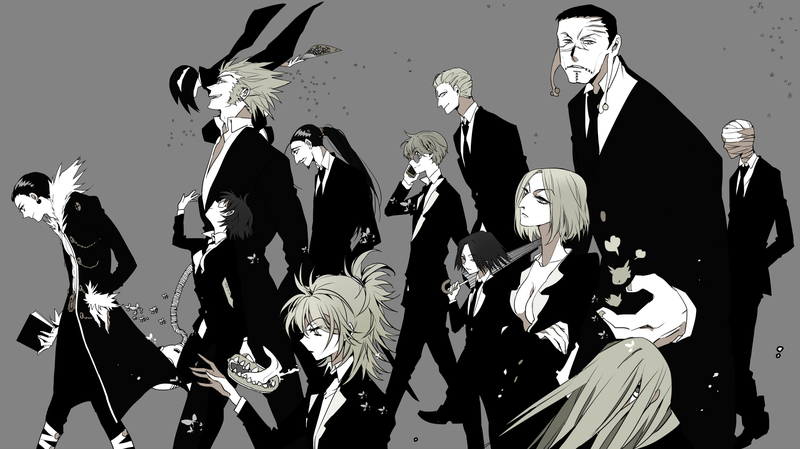 I haven’t seen Hunter x Hunter at all but from your description, the Phantom Troupe is a group of bad guys that has a lot of honor which is a rare thing to see. 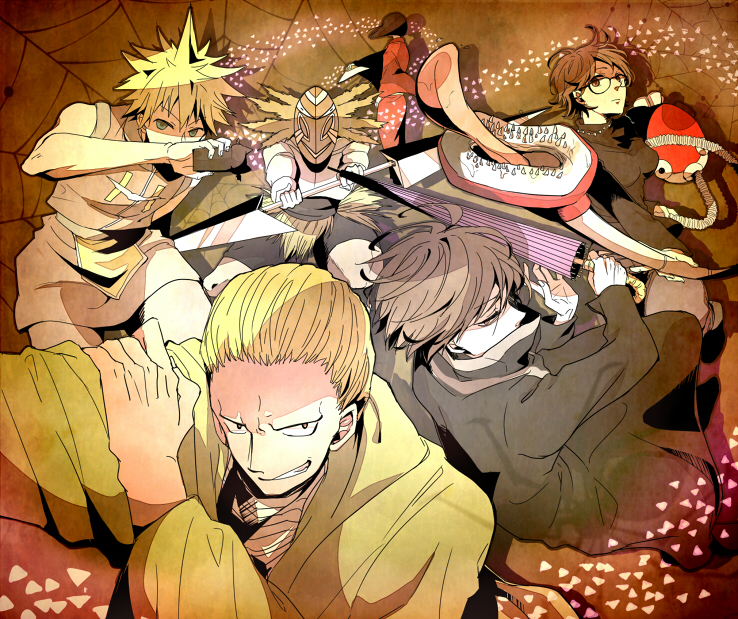 The only groups that come to mind that have honor among them but commit crimes towards others would be the Akatsuki from Naruto Shippuden, Skillout from Index/Railgun, P.O.G and Orpheus Order from Phi Brain (At the beginning at least for the last one). The members respect each other but are cruel to those in their way or their targets. I will do my best to get to it as soon as I can Anaaga. I’m so preoccupied with so many other animes out here. Ah man, it’s coming back to me all of a sudden, all these FEELS. What a great arc, what a great troupe. Arguably the best arc in the series for me. My love for HxH stopped a bit since the hiatus extended but the Phantom Troupe and Greed Island will stick as my two favorite parts in the whole story.